Motorbike taxi association president Chalerm Changthongmadan proudly displays a stylised portrait of his hero, fugitive former leader Thaksin Shinawatra, emblazoned on the orange vest that marks him out as a "moto" driver. "We miss Thaksin, 100 per cent," said Mr Chalerm of the former billionaire tycoon, who was ousted in a 2006 coup and whose sister Yingluck Shinawatra is the new premier after storming to victory in a July 3 election. Thaksin is adored by many poor and working-class Thais for his populist policies while in power, such as microcredit schemes and cheap healthcare, and the motorcycle taxi riders are among his biggest fans. Officially, there are a little more than 100,000 motorcycle taxis in Bangkok, but Claudio Sopranzetti, researcher in anthropology with Harvard University in the US, believes there could be around 200,000. Sopranzetti said that after Thaksin took power in 2001 he moved to formalise the motorbikes as part of efforts to combat "dark influence, which basically meant a fight against different kinds of corruption and local mafias". He said the taxis, which are estimated to generate a total B100 million a day, were originally run by police-backed local mafias. But these forces were pushed out as Thaksin sought to register each driver and equip them with the orange vests that have become their uniforms. In the five years since his ouster, however, the taxis’ "protectors" have crept back into the picture, he said, extorting an estimated B1,000 a month on average from drivers, who earn about B300-1,000 a day. With about 70 per cent of taxis tapped for a slice of their income, the bikers are keen to see an end to the corruption. 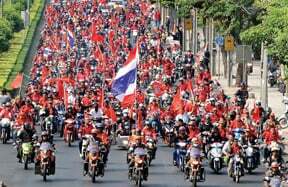 But he said the motorbike taxis are also a political entity – with around 80 to 90 per cent linked to the pro-Thaksin "Red Shirt" protest movement. Many hail from the rural northeast – the heartland of Thaksin supporters. During the bloody street demonstrations in 2006, which brought key areas of Bangkok to a standstill, the bikers acted as "fast moving troops", according to Chalerm. If Thaksin, who lives abroad to avoid a jail term for corruption, were to return, Suksomboon said he would lead a group of motorbikes to the airport to welcome him back to Thailand with a fanfare.